"This is an easy, yummy, very addictive candy. Since there are only two ingredients, it is essential to use only high quality ingredients." 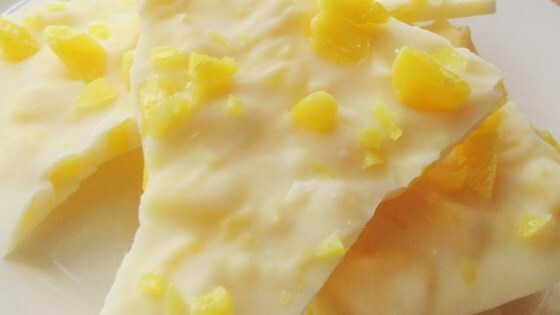 Place white chocolate chips in a microwave-safe 2-cup measuring cup; heat in microwave until melted, about 2 minutes. Stir until smooth. Place lemon drop candies in a resealable plastic bag. Place this bag into another resealable bag, creating a double bag so the candies don't puncture the bag. Crack candies with rolling pin or mallet until broken into small pieces. Stir cracked candies into melted white chocolate. Smooth mixture onto a piece of aluminum foil to about 1/4-inch thickness. Chill in refrigerator until set, at least 30 minutes. Break bark into small pieces and store in an air-tight container in the refrigerator. This easy Easter confection is like peppermint bark but with fruity jellybeans. Very pleased. Ghirardelli chips are the best with good quality lemon drops. i made this. it was easy and everyone loved it.